Slack has added new ways to interact with Microsoft’s Office 365 app directly from its own collaboration platform. This includes an Outlook calendar app, Office file previews and the ability to export emails into Slack channels and direct messages. The integrations announced on Tuesday are part of wider moves to connect Slack with productivity apps from a range of vendors, said Andy Pflaum, Slack’s director of product management for interoperability. The variety of third-party app integrations has long been a strength of Slack’s (it has added more than 1,500 so far), helping users work without forcing a switch between applications. The list of integrations includes productivity and business apps from vendors such as Google, ServiceNow and Salesforce. “We recognise that our customers are going to have a variety of tools that they use in the workplace,” said Pflaum. “Nobody today has just a single stack from Microsoft, Google, Cisco or Salesforce. Virtually every enterprise has a mix of solutions from different providers. “We think [the Office365 integration] helps us take a further step forward in being a true collaboration hub,” he said. Wayne Kurtzman, research director at IDC, called the integration with Office 365 an example of Slack’s commitment to an open-app ecosystem. “This openness that facilitates work, now with this deep Microsoft integration, allows users to communicate on the appropriate platform for the message – and collaborate within the complete IT stack,” he said. The new Outlook Calendar app sends a notification in Slack when users are invited to a meeting, and highlights any scheduling conflicts. Video meeting notifications will also include a link to conferencing apps, such as Webex, Zoom or Skype for Business. The latter is particularly noteworthy because Microsoft has folded Skype for Business into its Teams app, essentially creating a bridge between the two collaboration apps. The ability to sync with Outlook calendars will also enable automatic updates of a user’s Slack status – one of the most requested features from customers, said Pflaum. This means a Slack user’s status would be set to “in a meeting” in accordance with their Outlook calendar schedule, for example, or “out of office” if they have vacation days booked off. 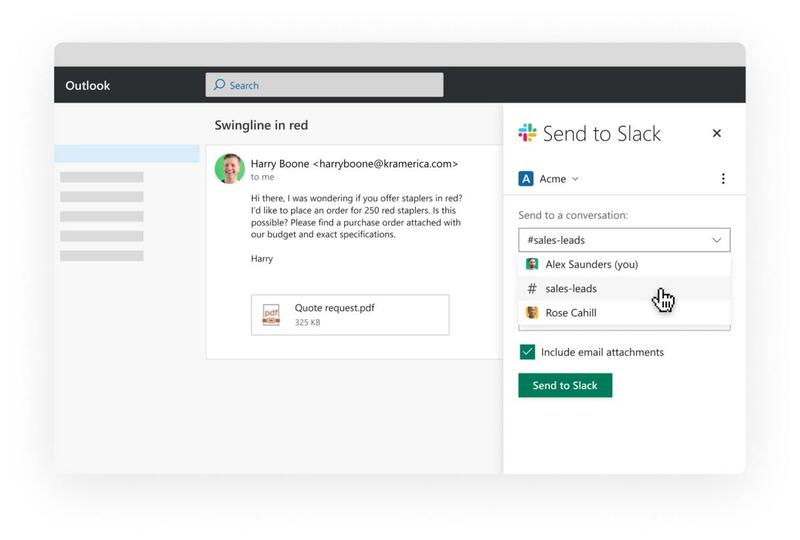 Slack is also looking to bridge the gap between its collaboration app and Outlook emails. The Slack for Outlook add-in lets users forward an email directly from their inbox to a Slack channel or send it as a direct message. This is done by clicking a Slack icon that appears in Outlook emails and selecting the channel or individual recipient. Team members in Slack can then view the email content from their chat stream, and open any attachments or notes. Email can be forwarded directly from Outlook to a Slack channel or user. The feature follows Slack’s acquisition of email management firm Astro (of which Pflaum was CEO and co-founder), late last year; Astro staffers were involved in ongoing plans to integrate more tightly with third-party productivity apps. “The email sharing is a direct nod to what we were doing in Astro and one of the things that we came to do when we got here,” said Pflaum. Slack also announced deeper integration with Microsoft’s OneDrive, making it easier to upload files from the cloud storage service. Slack users can click the “+” icon next to the message bar, select OneDrive and choose the file to share in a channel or direct message. Slack already provides integrations with a variety of cloud storage vendors, including Box, DropBox and Google Drive. For locally-stored files – the type of documents most commonly uploaded to Slack, said Pflaum – previews of Office docs will be available in Slack once a document is uploaded. This lets users scroll through a Word, Excel or Powerpoint file without having to download the whole document and open up the relevant app. “This is particularly handy not just on desktop but on mobile if somebody is on the go and wants to be able to quickly view a file,” said Pflaum. Mike Gotta, research vice president at Gartner, said that integrations are critical as Slack competes with Microsoft’s own collaboration app, Teams. Teams, which launched in 2017, is already being used by more than 500,000 organisations, though Microsoft doesn’t break out individual monthly or daily active user stats. In comparison, Slack, which debuted in 2013, has 10 million daily active users. “Any vendor that wants to compete with Microsoft over time has to be able to integrate with the rest of the Microsoft ecosystem where it is not really competing,” said Gotta. “It’s all about keeping a user occupied in Slack without having to spend time in Microsoft apps. Slack wants to be the key UI for your work and to diminish the time you would spend in Outlook, OneDrive, Word, Powerpoint, and Excel,” he said. The integrations announced today “allow Slack to ‘jump on top,’ to become the UI you use to do your work, relegating these Office365 capabilities to a back-end service,” Schoeller said.